WordPress is used by over 30% of all websites. With SEO – Search Engine Optimization-, you ensure that your WordPress website can easily be found by search engines. Speed is an important factor for improving your search results, as well as how the content on your pages is structured. SEO plugins help you with this, which is why it is not surprising that WordPress SEO plugins have continued to be developed and improved. Time to take a critical look at the best-known SEO plugins on the market! What WordPress SEO plugins are available? At the moment there are dozens of SEO plugins for WordPress. However, many plugins have hardly any installations or few features. The list below only contains WordPress search engine optimization plugins that have more than 50,000 installations, and are getting actively updated. Yoast SEO was introduced in 2010 and is used by more than 5 million websites. 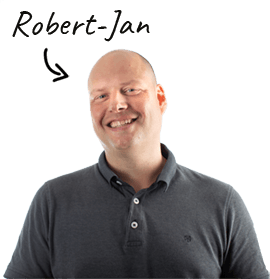 The plugin is developed by the Dutch company Yoast, and is currently the market leader for SEO plugins. The Yoast SEO plugin is very comprehensive and has numerous functions that can be used for free. A premium version is also available for those looking for more features, such as premium support and support for local businesses. The plugin is very popular with beginning WordPress users, and web agency clients are also often fans. Yoast works well, but nevertheless, some parties prefer other plugins. I will briefly discuss the features and power of Yoast SEO, and after that, I will explain why Yoast is not popular with everyone. Yoast SEO offers lots of flexibility when it comes to titles, meta descriptions, and provides tips regarding your content. Is the text readable, does it contain links, how and how often are keywords used, and many more. This is useful for beginning copywriters for whom these things aren’t yet second nature, and for advanced copywriters who want to check their work. The plugin is very easy to use and includes a wizard to check the default settings. 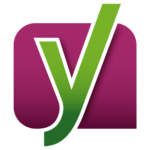 Other popular Yoast features are XML Sitemaps and breadcrumbs. Breadcrumbs refer to a “breadcrumb trail” that allows users to easily navigate back to higher pages. An example is the breadcrumb trail shown below, from our Savvii website. The premium Yoast SEO version contains extensive support for similar keywords and topics, an incredibly useful feature that makes the content recommendations a lot more accurate. 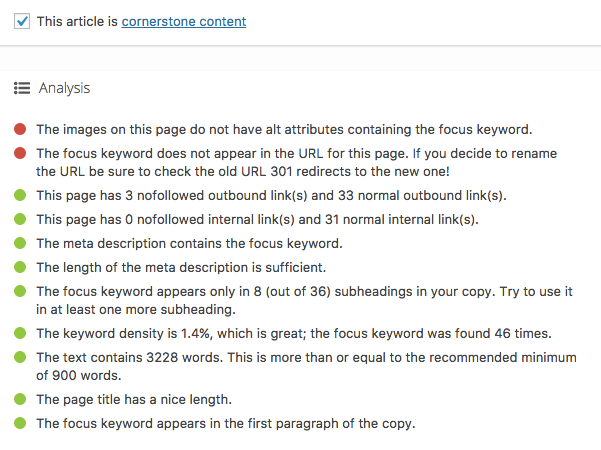 However, the most important Yoast SEO feature is the content analysis. The text is read and tips are provided automatically: use the keyword in a heading, place the keyword in the last paragraph, etc. These tips are incredibly educational for beginning SEO writers and clients who write content themselves. Critique: what is less positive? The Yoast settings panel has changed a lot since the split into a free and premium version: there are many banners for premium products. According to the Yoast website: “You’ll see ads for our other awesome products and services.” There is nothing wrong with a premium version of a plugin, but the Yoast dashboard has become a lot less calm. This is unnecessary, as WordPress users that view the source code probably already know Yoast. Showing the plugin version may also be a security risk. If a leak is found in a certain version, bots can use this HTML tag to target websites that use this version of Yoast. Yoast SEO is a good WordPress plugin for beginners and users who don’t want to worry about different functions or settings. The plugin is like an electric bike with a bell, special lights, side wheels, a pump, panniers, and more: lots of functions and useful in all situations. However, when you only need a simple bike, it might be a bit too much. An interesting alternative to Yoast SEO, is The SEO Framework. The plugin is developed by a Dutch company and is a good choice for WordPress users who are looking for a fast, lightweight plugin for search engine optimization. Speed seems to be the main priority for The SEO Framework. Features that are not necessary for everyone are not included in the plugin by default. Free extensions are available for those who do want these features, such as AMP pages or removing the HTML tags that show that The SEO Framework is being used. The SEO Framework is a plugin that focuses on simplicity. There are no functions that only a few users need, no ads, and above all it is easy to use. After installation most settings are correct for everyone: people who know a bit more about SEO can change these settings themselves. All these settings are on one page, which makes them easy to find. 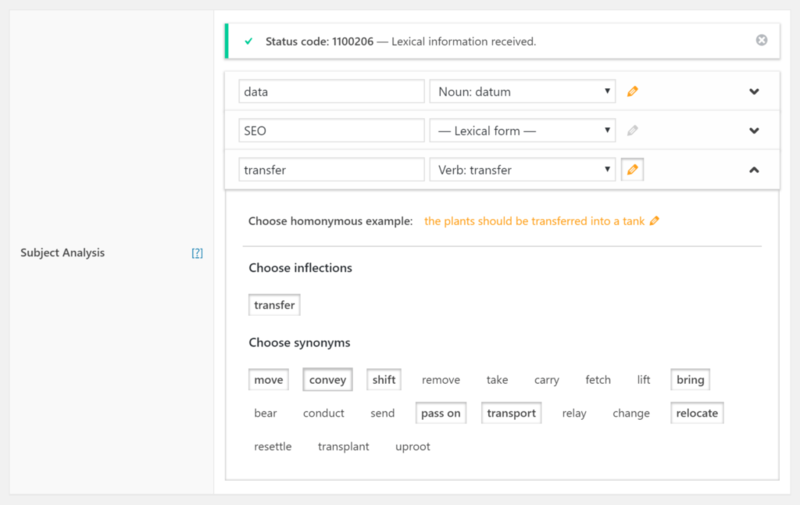 The plugin uses AI to intelligently handle keywords: enter a subject (such as “data SEO transfer”), and select synonyms for one or more words, in this case, “transfer”. The SEO Framework contains all the basic SEO functions, such as structured data and metadata, supports custom post types, and allows users to adjust how shared links are displayed on social media. The SEO score given to different sections is not a number, but a color. The plugin performs better than other SEO plugins: The SEO Framework is very fast. The SEO Framework is more minimalist than other SEO plugins such as Yoast. This is great for some users because they already know what to do, but less so for beginning users. For example, Yoast SEO has an installation wizard, an extensive information section, and countless virtual ‘tours’ to guide the user through all the possibilities. The SEO Framework has none of these. Conclusion: The SEO Framework is an interesting option for web agencies and SEO experts. For people who are used to a plugin like Yoast SEO, The SEO Framework will take some getting used to: the plugin looks a bit minimalist. The dashboard looks calm, the plugin has little impact on the speed of your website, and has roughly the same features as other SEO plugins. Despite the fact that the plugin is easy to use, the simplicity of The SEO Framework will primarily appeal to those more experienced with SEO. An interesting option for web agencies! When search engine optimization plugins became more popular, the competition was mainly between Yoast SEO and All in One SEO Pack. Although Yoast SEO is used more often (5 million installations vs. 2 million installations), All in One SEO Pack is still actively getting developed and updated, and is still a good option. 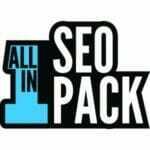 All in One SEO Pack has all the basic features you would expect from an SEO plugin and has some interesting additions. A premium version is also available, which is especially popular because of the support that comes with it through a forum, videos, and email. 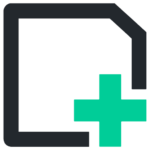 All in One SEO Pack blocks bots and allows users to change the robots.txt and .htaccess files: useful for advanced WordPress users. The plugin supports Open Graph (for sharing links on social media), and AMP. In addition, attachment pages are automatically redirected to the parent pages so that these low-content pages are not indexed by Google. The biggest difference with other SEO plugins: All in One SEO Pack does not analyze content. No recommendations are made regarding keywords, and All in One SEO Pack does not give any tips for improving readability. Experienced SEO writers will not miss this feature (and sometimes switch this off in plugins like Yoast because the analysis is not always correct), but beginning SEO users can learn a lot from these types of recommendations. All in One SEO Pack also doesn’t support SEO taxonomies, such as category and tag meta titles. Those who do want this will need to purchase the premium version. Yoast SEO does offer this in the free version. All in One SEO Pack is in between Yoast SEO and The SEO Framework. The plugin provides a middle ground for those who find Yoast SEO too extensive, and The SEO Framework too minimalist. No content recommendations are made, and for that reason, it may be less suitable for text writers who are unfamiliar with SEO. For WordPress users who are familiar with this, and who do not use the Yoast SEO recommendations, All in One SEO Pack is a great alternative. It is not easy to compare these three WordPress SEO plugins in a table. While they all have overlapping features, these features have been executed very differently. These differences are difficult to show in a table, but it does offer an interesting overview. Conclusion: Which WordPress SEO plugin is the best? Which of the WordPress SEO plugins mentioned above is the best depends on the user. One thing is for sure: all of these plugins improve a website’s SEO from the moment they are installed. The best choice for beginning text writers, and/or users that don’t have SEO experience, is Yoast SEO. A comprehensive and very user-friendly plugin with everything a website needs, and more. Experienced SEO WordPress users who are looking for fewer distractions, don’t use many of the Yoast SEO feature links, and prioritize performance, will not regret using The SEO Framework. Those who are familiar with the SEO basics and don’t like working with the plugins mentioned above will appreciate the All in One SEO Pack.